One of the weakest links in fortress defence are the entrances, so it is hardly surprising that much ingenuity goes into their design. 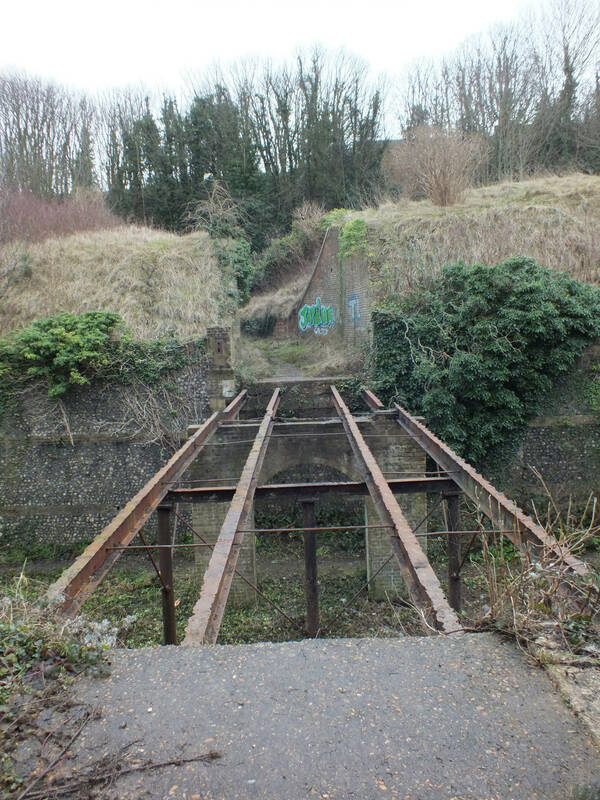 The North Entrance to the Western Heights was the nearest to the town of Dover and most convenient for access, either for supplies or by an attacking force. Accordingly, its defences were substantial, comprising two bridges and a tunnel. The entrance dates from the Royal Commission period of the 1860s, and superseded the entrance dating from Napoleonic times – a single bridge over a ditch. The two bridges crossed twin ditches (or lines), which were separated by an earth bank – the tenaille. Neither bridge was fixed. The outer of the two had a drop-down section hinged at the tenaille end, while the inner had a section that could be raised. The roadway cut through the tenaille was ‘S’ shaped, so that artillery fire could not be brought to bear on the inner entrance (to the tunnel) from the approach road. 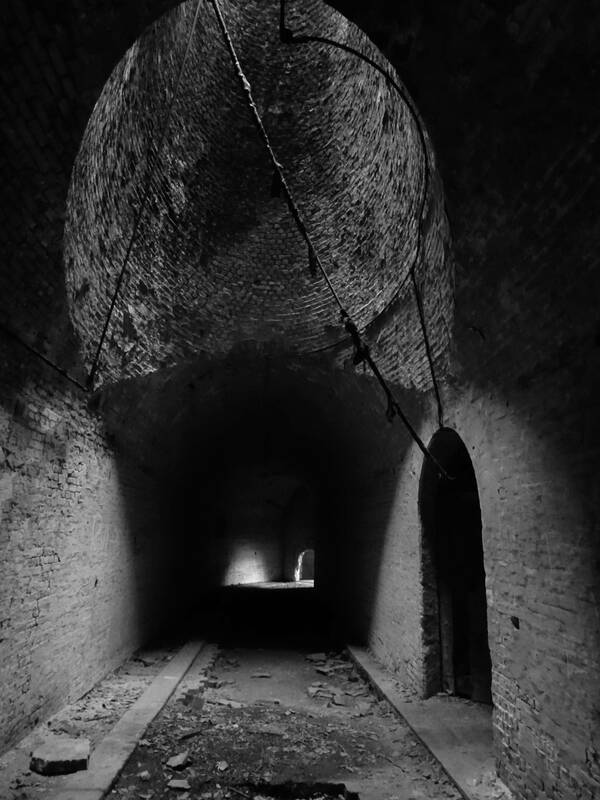 Having crossed the two bridges, the road enters a tunnel which had a pair of large doors at its outer end. These slid on rails set in deep on slots either side of the tunnel, and did away with the obvious weakness of hinges. The tunnel then turns sharp left, runs straight for 50m or so, then turns right towards the inner gateway. The road bed of the tunnel was laid with 6” cubes of oak, probably to guard against sparks. Halfway along the tunnel, a staircase leads down to three gunrooms, (plus an artillery store, and a magazine), which are level with the bottom of the ditches. Each gun room would have been equipped with a carronade – a short, large bore anti-personnel cannon that would have fired canister shot rather than a solid ball. Canister shot comprised a thin metal cylinder filled with musket balls. On firing, the cylinder would disintegrate allowing the musket balls to sweep the lines, rather like a gigantic shotgun. The gun ports could be closed by sliding iron shutters to ensure security while the carronades were being reloaded. 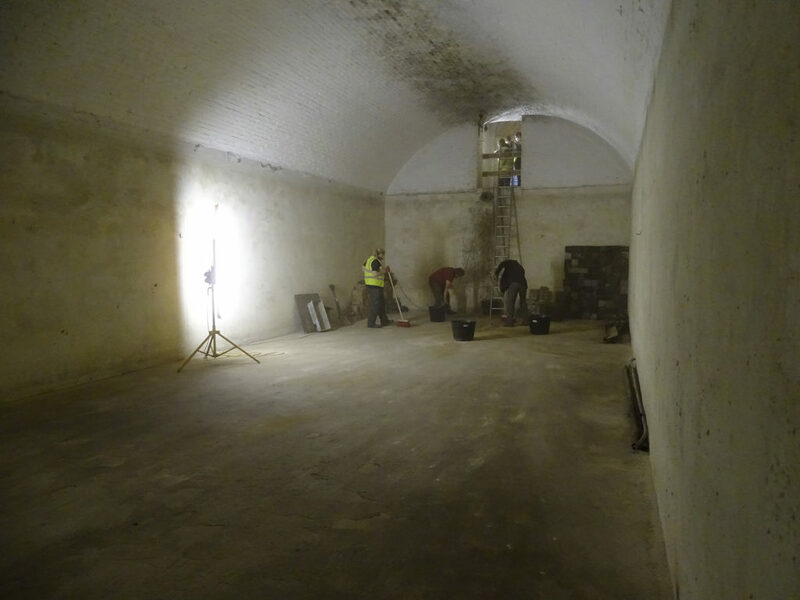 The gunrooms are equipped with fireplaces since they would also be used as accommodation for the gun crews. The staircase, which is still in good condition, has ramps either side of the steps. These were used for manipulating the carronades and ammunition up and down on trolleys. 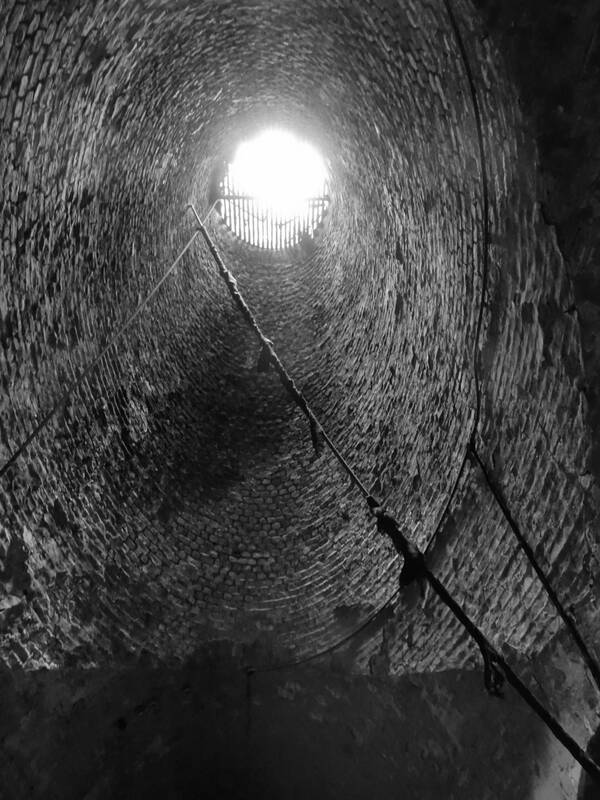 In the roof of the tunnel, level with the staircase, is a ventilation shaft & light well from the ramparts above. In addition, there are also loops for muskets alongside the gun ports so that an enemy, whether approaching along the bottom of the lines or over the bridges, could be exposed to heavy flanking fire. The gun rooms were utilised as an operational command post during World War II. Just before reaching the inner end of the tunnel a short passage on the left leads to three enormous brick vaulted water tanks that supplied Grand Shaft Barracks. They were filled via pipes from the well at the Citadel. A narrow tunnel (now partly blocked up) carried the conduits to the barracks below. At present two of the tanks are full of rubble but the third is empty and in good condition. This fine brick structure is easily accessible from the road. 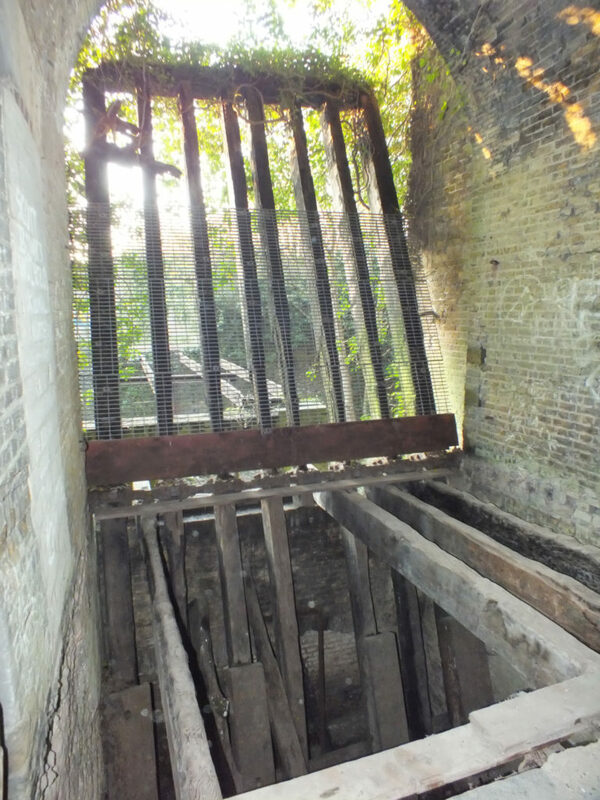 The Guardroom (now stripped of all its fittings) still contains an example of a ‘Sir Douglas’ grate. Named after its designer, Sir Douglas Strutt Galton, the grate has ducts built into it allowing cold air to enter at the bottom and warmed air to exit via louvres at the top – an early form of central heating, and much used by the Army for heating barracks, hospitals, etc. The walls flanking the approach to the tunnel are pierced by many brick-sized holes; these are the sockets for original wooden scaffolding used during construction. Until the present road was cut through the North Lines in the 1960s, North Entrance was one of two road entrances to the Heights. More recently, since the tunnel is ‘single carriageway’ traffic lights at each end controlled the passage of vehicles. The lights were activated by sensors beneath rubber strips at each end of the entrance, both sets of which are still in existence. The lights have since been removed. The North Entrance complex suffered in the 1960s when Western Heights was seen as ripe for light industrial development rather than as an important historical site. 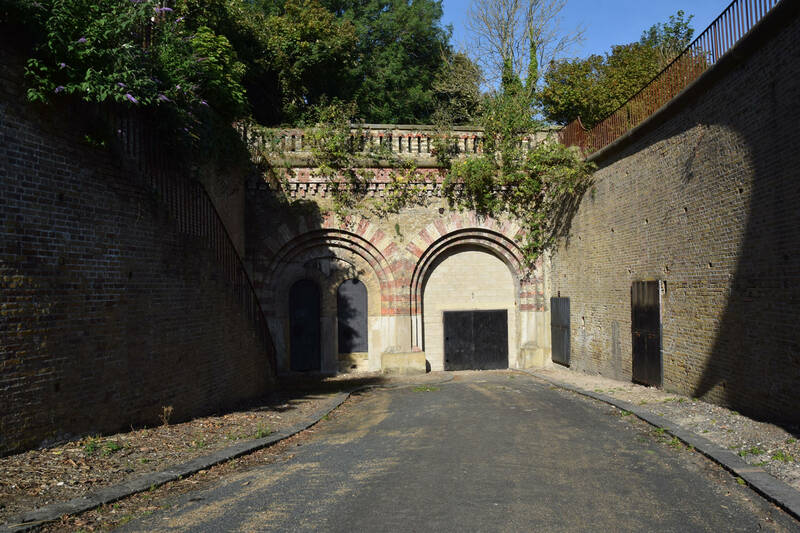 The cutting of the present road through North Lines – to allow road widening for heavy vehicles, and the demolition of Archcliffe Gate (the southern entrance) for the same reason – has destroyed the integrity of the fortress. There was also the intention to use the Lines as a landfill site for household rubbish! Fortunately the whole site has been given Scheduled Ancient Monument status and preserved for posterity. The North Entrance complex is in the care of English Heritage and access is controlled by the Western Heights Preservation Society and has opened for Heritage Open Days since 2016.